At opposite ends of the political spectrum for years, Chief Minister Bhupinder Singh Hooda and Tosham MLA and former Minister of State Kiran Choudhry are learnt to be mending bridges. Monsoon and misery have become synonymous for residents in about 36 low-lying villages along the Yamuna in Karnal. Year after year, the people here face the fury of floods, undergo the agony of devastation, wait for succour and start life afresh with little help forthcoming. Contrary to claims of the state government of having brokered peace with Jat protesters seeking OBC status for the community, the Akhil Bharatiya Jat Aarakshan Sangharsh Samiti reiterated its threat to disrupt the supply of essential commodities, including milk, to Delhi during the Commonwealth Games. A labourer was buried alive while two others sustained injuries when the wall of an abandoned building collapsed on the Malgodham road here today. The incident took place around 3.30 pm. While the deceased has been identified as Kuldeep Kumar, the injured are Sonu and Anju. Addressing a state-level mammoth martyrs’ memorial conference held to mark the “Haryana Veer and Shaheedi Diwas” at the Rao Tula Ram Stadium here today, Chief Minister Bhupinder Singh Hooda paid tributes to heroes and martyrs who laid down their lives in various wars for the country. The Faridabad Deputy Commissioner is in the contempt loop for allegedly indulging in loose talk with a court secretary. Taking cognisance of his action, Justice Permod Kohli of the Punjab and Haryana High Court today said the officer had “exceeded his brief” and asked him to show cause why the charge of contempt not be framed against him. The Haryana government will recruit 500 doctors next month to fill vacancies in government hospitals, Health Minister Geeta Bhukkal said here today. Talking to mediapersons here, she said improving health and educational infrastructure was the government’s priority and doctors’ recruitment was part of the drive to better facilities. The authorities here have issued a show-cause notice to pharmacist of Central Store at the local civil surgeon’s office after a sample of iron and folic acid suspension was found to be substandard. The Haryana government’s easygoing manner of dealing with employees facing allegations of corruption has not found favour with the Punjab and Haryana High Court. It has held the state at fault for “leniently” dealing with a bus conductor punished nothing less than 37 times. The state unit of the All-India Jangir Brahmin Mahasabha organised a function to felicitate Chief Minister Bhupinder Singh Hooda here last evening. Activists of the Jangir Brahmin Samaj from all over the state participated in it enthusiastically. Additional District and Sessions Judge Sandeep Garg has convicted an extortionist, Subhash, of Sisaye village near here of murdering a businessman, Sushil Jain, at Hansi two years ago. One of Hooda’s most vocal critics in his first term as Chief Minister, Choudhry’s unusual “silence” and her absence during the last assembly session is being interpreted as a consequence of the truce between the two. The patch-up between the Hooda-Choudhary camps has manifest itself in the Congress win in the zila parishad election of Bhiwani where the latter’s candidate was elected president. This change of heart has been necessitated to check INLD chief Om Prakash Chautala’s growing influence in the Jat belt. Only recently, the INLD won the Sonepat zila parishad president’s post in the Congress stronghold. The Jats in the Congress feel that power game could tilt in favour of the non-Jats if they continued to be a divided lot. In this backdrop, a meeting between Hooda and Choudhry took place at Delhi recently where a senior Congress leader, once a confidant of the Choudhry’s father-in-law and former Chief Minister Bansi Lal, was instrumental in dispelling the “misunderstanding” between the two. Sources maintain that while the Hooda camp agreed to give Choudhry and her MP daughter Shruti their due in terms of developmental projects and recognition, Choudhry, the most popular face in the dissident camp, is learnt to have invited Hooda to address a rally in her bastion on her husband, Surinder Sngh’s birth anniversary in November. Inducted as Minister of State with independent charge in the first term of the Hooda government after the death of her husband in a chopper crash, Choudhry, known for her connection with the Congress high command, had taken the government head-on. Her pointed queries in the Haryana Assembly would often prompt the Opposition leaders to remark that the Congress did not need them with Choudhry around. Relations between former Union Minister of State and Gurgaon MP Rao Indrajeet Singh, and Hooda, too, have improved. The two shared the stage at a rally to mark Shaheedi divas. Also, Rayja Sabha MP Birender Singh’s nomination was supported by the Hooda camp. The apology to Union Minister Selja by villagers from Mirchpur is also being seen as part of the strategy to woo back dissidents. The Hooda camp maintains that an olive branch would be shown to other members of the dissident camp in the weeks to come. Reeling under the fury of floods year after year, farmers are demanding lifting of ban on sowing of ‘sathi’ in the river basin. Even CSSRI scientists feel that sowing of the ‘sathi’ variety of paddy should be allowed in areas that have sufficient water to recharge groundwater. 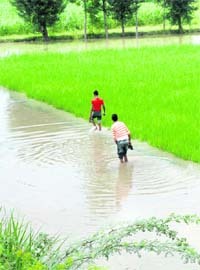 The cultivation of ‘sathi’ rice is banned as it is highly water consuming. “Why has the government not been able to find a permanent solution to the problem of floods and where have crores of rupees claimed to have been spent on flood protection measures gone,” ask villagers of Nabibabad. “All we get are announcements. We are left to fend for ourselves after the flood waters recede,” they say. Rains keep the people on the tenterhooks and they spend sleepless nights for almost three mo, with prolonged monsoon prolonging their misery. While the rains are suppose to brighten the crop prospects, these villages helplessly see their land washed away and crops destroyed. The apathy and indifference of the authorities add to their woes and the villagers neither get adequate compensation nor a permanent solution to the problem of recurring floods. “The relief provided by the government is too meagre, the announcements made by ministers are seldom implemented and once the floods are over,” said Sniveled Murslin, a small land-holder of Sayeed Chhapra. This year was one of the worst with the villages flooded each time water was released from the Hathanikund barrage into the Yamuna river. More than 20 lakh cusecs of water has been released from the barrage this monsoon, 7.44 lakh cusecs of water during the past four days. The villages have been flooded six times since July. The floods leave a trail of destruction and the real anguish starts after the water recedes. Nabiabad, Sayeed Chapra, Japti Chapra, Nagli, Bona Kheri, Chandrao, Hansu Majra, Chogawn, Jammu Kalan, Mustafabad, Khukni, Garhi Birbal and dozens of other villages get submerged in floods every year. The ambitious Yamuna channelisation plan is making slow progress, breaches in embankments of the rivers and their tributaries have become routine and the flood-hit are left to fend for themselves with no relief and rehabilitation mechanism in place. Addressing a press conference at the Press Club here today, samiti president Yashpal Malik said the protests would continue till their demands were met and Jats were given reservation. Claiming that they were geared up for “ guerilla protests,” Malik said members of the Jat community would block rail and road traffic to the Capital. "We have waited enough for the government to respond to our demands. Our patience has run out. Holding demonstrations seems the only way to make ourselves heard. If the government uses force to suppress our agitation, we will not be responsible for the consequences,"he held. Emphasising that he had never called off the agitation, he said the agreement with the government was limited to compensation for family of the Hisar firing victim. “We stand by our decision to snap off supply lines to Delhi during the period of the Games," Malik said, adding that the samiti’s members had bought tickets to the Games and would lodge their protest by showing black flags outside and inside the stadia where the games were in held. Also, black flags would be shown when the Queen’s Baton passed through the state, beginning September 26. He clarified that the samiti would call off the agitation if the Centre assured them of considering their demand favourably. To a question on violence during protests in Hisar, Malik said anti-social elements trying to draw mileage from the protest were to be blamed. “We have mobilised our members by organising conferences all over the state and are prepared to take on the government,” Malik added. A labourer was buried alive while two others sustained injuries when the wall of an abandoned building collapsed on the Malgodham road here today. The incident took place around 3.30 pm. While the deceased has been identified as Kuldeep Kumar, the injured are Sonu and Anju. They were rescued from the rubble and taken to the PGIMS here in a critical condition. The labourers had been employed to dismantle the entire building and remove the debris. However, as they were trying to remove bricks from inside, a portion of the wall caved in, burying them under it. Nearby shopkeepers, the police and the district authorities rushed to the spot and got the debris removed with the help of JCB machine. While two labourers were pulled out alive, the third could not be saved. The police said it was trying to identify the owner of the building and had registered a case. 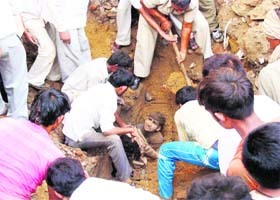 SONEPAT: Two labourers, identified as Thakur Bharti of Raghu Nathgiri in Chhapra district of Bihar and Ramjit Yadav of Gonharia in Siwan district of Bihar, at present residing at Ramnagar in Biswan Meel, near Rai, were killed when they were buried under the debris of chimney of a brick-kiln at Janti Kalan village in the wee hours today.Another labourer, identified as Anoop Singh of Rathdhana, was injured in the incident and had been admitted to the civil hospital here. The incident took place when the victims were unloading concrete from a truck near the chimney of an abandoned brick-kiln around 4 am. After receiving information, the police and residents of Janti village reached the scene and retrieved the bodies of the victims from the chimney debris. The victims were brought to the civil hospital where doctors declared Thakur and Ramjit as brought dead. MP Rao Inderjeet Singh, a descendant of Rao Tula Ram who was a hero of the 1857 war, presided over the conference. The massive turnout, which comprised residents of the Ahirwal, Mewat regions and the neighbouring Rajasthan territory, clearly indicated that Inderjeet Singh’s grip over the entire region was quite firm. The Chief Minister mentioned the historic battle which was fought at Naseebpur, near Narnaul, on November 16, 1857. He said Rao Tula Ram, who was the commander-in-chief of the Indian forces in that battle and who subsequently went to Kabul where he died on September 23, 1863, had become a source of inspiration for freedom fighters of the country. Ruefully stating that South Haryana had remained deprived of its legitimate share in the canal water as well as development during the past four decades, the CM asserted that soon after the apex court cleared the pending case pertaining to the Hansi-Butana Link Canal, the peasantry in South Haryana would start getting its full quota of the canal water for their fields. He reiterated the government’s commitment to turn Rewari into “London” . Nearly 300 war widows of South Haryana were honoured on the occasion. Dr Jitender Singh, Durru Mian, both ministers in the Rajasthan Government, MP Arvind Sharma, MP Rao Inderjeet Singh, HPCC chief Phool Chand Mullana, Shamsher Singh Surjewala, several legislators of Haryana and Rajasthan and others also spoke. SONEPAT: Eight war widows of the district were honoured at a function organised by the Sports Department at the Shivaji stadium here. They were: Shamu Devi of Murlana village, Shavitri Devi of Sonepat, Atri Devi of Pinana, Santra Devi of Garhi Bala, Santosh Devi of Sardhana, Roshni Devi of Bhainswal Kalan, Sudesh Devi of Ahulana, Santosh Devi of Kathura. Renowned educationist Dr Sant Ram Deswal, who was the chief guest, paid rich tributes to the martyrs. The Sonepat police also remembered the martyrs by observing a two- minute silence at the Police Lines. KAITHAL: Thirty war widows were honoured and presented shawls by ADC BB Kaushik at Government Senior Secondary School here The ADC also offered tributes at Sheheed Vikas Bhardwaj memorial.Schoolchildren participated in a rally. Speaking at the function Kaushik recalled the sacrifices made by martyrs during the freedom struggle and after independence while fighting on war front or during other operations. He also paid tributes to Rao Tula Ram who too made supreme sacrifice during the war of independence. Justice Kohli observed the Deputy Commissioner was, vide order dated July 2, asked to remain present in the court, along with the original record. On August 12, he failed to appear. Again on September 14, he remained absent. But after the matter was reserved, the Deputy Commissioner came to the courtroom and sought a personal meeting with the judge, which was declined. “He attempted a second time to meet me. Again, he was informed not to press for a meeting with me,” Justice Kohli asserted. “The Deputy Commissioner, thereafter, made a written application and handed it over to the court secretary. He also made a comment that he was made to stand throughout the day. “When the court secretary informed him that these observations amounted to contempt, he remarked he was not bothered about contempt. It is evident that the officer has exceeded his brief. He has made unnecessary remarks, which prima facie amount to contempt of court. “The court was inclined to issue warrants for his appearance. But counsel appearing on his behalf undertook to cause his appearance on the next date of hearing. The Deputy Commissioner will show cause why a charge for contempt be not framed against him”. The direction came on a petition filed by Faridabad-based Hello Communication. It was seeking the quashing of an order allocating contract for preparing smart cards driving licences and registration certificates. The minister said three new medical colleges were coming up at a cost of Rs 617 crore. These were located at Mewat, Khanpur Kalan and Karnal. The hospital at the proposed medical college at Karnal would be functional soon. Bhukkal, who is also Education Minister, said the government was considering a raise in the honorarium paid to guest teachers. These teachers have been agitating for a raise. The association appealed to the minister to grant government doctors the same pay scales as had been given by the Punjab government. The authorities have asked the pharmacist to recall all stocks of the “substandard” drug and send it back to the supplier. “Samples of Fromec HB Plus, a heamatinic solution manufactured by Noida-based Unicare (India) Private Limited has been found substandard,” said Rajnish Dhaliwal, District Drugs Control Officer. He said the suspension containing iron and folic acid was supplied in 100 ml bottles under the Reproductive and Child Health (RCH) Scheme of the government with “RCH - II Supply Not for Sale” inscribed on the bottles. Civil surgeon Dr Narinder Chaudhary confirmed that samples of the suspension given to children under the RCH scheme had been found “below par” during lab tests. The suspension, he said, was meant for administration to children below the age of five. Commenting on the state’s functioning while dismissing conductor Raj Kumar’s plea with Rs 10,000 costs, Justice Ranjit Singh has asserted: “The petitioner has been dealt with leniently. The allegation against the petitioner is of having embezzled the fare of over 30 passengers, which is a serious allegation and was required to be dealt with all seriousness. “The petitioner has clearly been let off lightly. This action in leaving the petitioner lightly would appear more grave, when seen in the background that this is not the first and the only occasion when the petitioner was so caught. There are 37 instances of imposing punishment on him and yet he was treated in this lenient manner”. Coming down heavily on the conductor for his attempts to even hoodwink the court, Justice Ranjit Singh asserted: “Over and above, his conduct is such that he has made a serious attempt to suppress the facts and to mislead this court”. Justice Ranjit Singh observed: “The facts, suppressed by the petitioner in this case, are material. These have been suppressed not innocently, but with a purpose and design to mislead the court. “The writ petition, therefore, is dismissed with exemplary costs, which are assessed as Rs 10, 000. The costs shall be deposited in the account of the Legal Services Authority, Haryana. The Advocate-General, Haryana, would ensure that the costs are recovered from the petitioner. Welcoming the Chief Minister, Vidya Sagar, state president of the mahasabha, used the occasion to present him a charter of their demands. He listed the achievements of the Chief Minister. Speaking on the occasion, the Chief Minister said the government was providing all possible assistance to backward sections of society, including the Jangir Samaj. The Chief Minister announced a financial grant of Rs 11 lakh out of his discretionary fund for the local Vishwakarma Senior Secondary School. Finance Minister Ajay Singh Yadav, HPCC president Phool Chand Mullana and chief parliamentary secretaries - Rao Dan Singh and Anita Yadav - also addressed the convention. Subhash had demanded a ransom from Jain, which the latter refused to pay. On July 22, 2008, three youths came to his shop on a motorcycle and shot him dead in broad daylight. The judge found Subhash guilty but acquitted another accused, Pardeep, alias Kalu, for want of evidence. Three other accused in the case - Surinder, Deepak and Sonu - are undergoing trial in the case in a juvenile court. The judge will fix the quantum of sentence on September 25. The Jain family was under acute pressure from notorious criminals not to depose against the accused in the case. Jain’s son and his grandsons were fired at several times during the trial. The family shifted from Hansi to Fatehabad because of the threats. The Jains have private security guards for their personal security.